Many Ålanders associate the name Ålandsfärjan with the ship servicing between Mariehamn and Kapellskär 1987-2008. However, the ship featured on the 2013 stamp is the very first ferry named Ålandsfärjan. 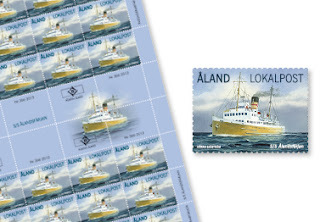 Following a disagreement between the founders of Rederi Ab Vikinglinjen, the shipping company that pioneered passenger traffic between Åland and Sweden in 1959, a group of owners started the competing shipping company Rederi Ab Ålandsfärjan. S/S Ålandsfärjan was built in Scotland in 1933 and named S/S Brittany. Ålandsfärjan was the first ferry in service for the newly started company. Operations between Roslagen on the Swedish coast and Mariehamn in Åland began on 20 June 1963. The ferry was originally owned by the British Railways and in service on the British Channel. S/S Ålandsfärjan was withdrawn from service in 1972 and demolished in Teijo, Finland, after having run aground and been damaged.